The sunlight tapped gently on the glass window. A soft breeze slipped through underneath. Clouds decorated sky, a portrait of life compared to the dark, dismal walls inside. A murmur of traffic hummed with rhythm, and vibrations fell quiet against smooth, pale floors. And the world continued on without a second thought, leaving this place, leaving me behind. Time had become a dream. Days were counted into nights, and nights were spent waiting for days. Whispers of the wind told of the seasons to come, and another end to another year passed by. Yet, I remain. I am denied from walking beyond these walls and disappearing into a world that has forgotten me, but somebody out there remembers. Someone knows why I remain left behind, but when will it be my time to go? Life once resided here. These empty hallways were decorated with portraits of family. Children raced by, scribbling crayon against the wall. Laughter rang out, a haunting sound that still finds me today. Arguments thundered like slamming doors, but now those doors lie broken against the floor. They’re all gone. Tragedy turned them away and broke them apart, and I was to blame. And they couldn’t stay with all these memories locked inside, and I begged to go with them. But they ignored me, and they packed up their things, wiped their tears, and left without a single good-bye. That was a long time ago. Maybe even a decade before now. I don’t remember. Time no longer matters, but here I am, waiting for my turn to go. I find myself drifting, existing without living, and my only connection to this world is captured through a glass window. And I beg for someone, anyone to come and pass by. Would they see me? Would they understand? How long must I be punished for my mistake? It was a game. A stupid game. We were being silly. It was late one night, and the parents weren’t home. What harm was there? It wasn’t even loaded, or so I thought. And the last sound I heard was that bang. The funeral was a few days later. The house was filled with mourners. My mother sobbed her heart out for hours afterward, and my brother hardly spoke. He just looked at me, knowing that I was there, watching him. Nobody believed him, but he spoke to me. He only spoke to me, and my father slipped into comfort through the beer in his hand. And then they were gone. My brother would often visit. He took a seat in the room where it happened. We would talk for hours. He made me feel real, alive, and I needed his company. And then he stopped visiting, and I lost track of time. I don’t know what became of him. Sometimes, I catch a glimpse of an elderly man drifting past the house, but he would stop before the glass window and stare right at me. But was that man my brother, and if so, why would he not come inside? Was he afraid that I was still here, or was he afraid that I too was gone? I have tried many times to leave. I can open the front door, but neighbors would argue that it was just the wind. I could step outside and feel the fresh air touch my face. Then, in a blink, I’m back inside, and the door is shut once again. I would keep trying to leave, but over time, I gave up. I have become a prisoner to my own home, and here is where I stay. But I grow tired of this. When will I be allowed to go? Today felt different. The sun was shining more brightly like a star ready to burst. Warmth flooded against these barren walls. A soft tremor rumbled through the floor. It was as if I was being prepared for lift off, and I heard something. It sounded like wings touching down, but it was coming from inside the house. And I ran through the empty halls in desperate search of another, but nobody was there. But I sensed that I was not alone. For the first time in a very long time, I was not alone, and I knew something was about to happen. A wave of white light rushed toward me. It reminded me of being at the beach, and I could almost feel the sand between my toes. Warmth engulfed me, and I imagined being pulled out to sea. The world remained behind on the sandy shore. Its sounds, its memory lingered on a soft, salty breeze, and white clouds decorated the perfect blue sky. 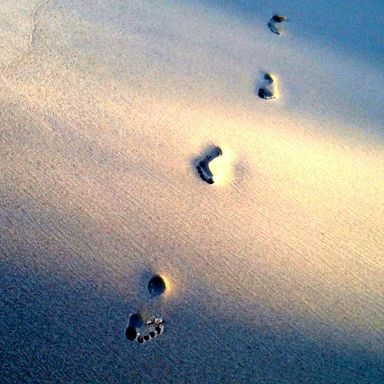 But as the waves carried me across into the golden horizon, my footprints remained behind, telling you that I was here.